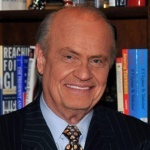 Fred Thompson has had one of the most unusual and interesting careers on the American scene today. It has encompassed the law, politics, radio, television and motion pictures. Thompson, a lawyer, first appeared on screen in the film Marie in 1985, portraying himself in the fact-based story of a high-profile public corruption case he handled in Tennessee. Since then, he has appeared in numerous movies including No Way Out, In the Line of Fire, Die Hard II, Days of Thunder and The Hunt for Red October. He became known for his portrayal of New York District Attorney Arthur Branch on the Emmy Award-winning NBC television drama, Law & Order. He also appeared in Disney’s Secretariat released in 2010, Summit Entertainment’s Sinister in 2012 and has done multiple guest spots on CBS’ The Good Wife. In 2013 he appeared on Broadway in A Time to Kill. Thompson served eight years as a Senator from Tennessee, and in 2008 sought the Republican nomination for President of the United States. Prior to his election, Thompson maintained law offices in Nashville and Washington. Earlier in his career, he served as an Assistant United States Attorney in Tennessee. In 1973, he was appointed by Senator Howard Baker to serve as Minority Counsel to the Senate Watergate Committee where Thompson first gained national attention for leading the line of inquiry that revealed the audio-taping system in the White House Oval Office. He detailed his Watergate experience in his Watergate memoir, At That Point in Time. In his recent book, Teaching the Pig to Dance, he humorously recounts his growing-up years in a small Tennessee In addition to his movie and TV appearances, he serves as a business consultant and spokesperson. He resides in McLean, Virginia with his wife, Jeri and daughter, Hayden and son, Sammy. His sons, Daniel and Tony, live in Nashville.